Review: The latest Houdini is an amazing release that brings improvements across the board for everyone. With so many improvements to core features, some rewritten from the ground up, Houdini 15.5 is essential; it has it all. SideFX recently released Houdini version 15.5. Houdini is well known for its use in VFX, fire, destruction and explosions, and simulation in general has become a synonym for Houdini. 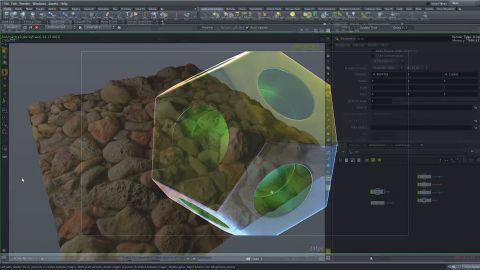 Houdini delivers in these areas in spades, but in recent years, more and more people are using it in other areas of the pipeline and some are even using it as the pipeline, replacing all sorts of software with its powerful procedural workflow. This has brought many improvements in other areas of Houdini, such as modelling, animation and even virtual reality. Houdini 15.5 brings a set of really refined modelling tools that began evolving in recent releases. This includes tools like the TopoBuild, PolyBevel and PolySplit, which are now as good as tools in other applications, and even better if you consider that every tool in Houdini can be used procedurally. In the past, people had reservations about Houdini's modelling tools, but these tools plus the new loop selection and snapping improvements make Houdini a tool for any modeller. You can now model from scratch or retopologise your models for games or VFX inside Houdini. One of the most acclaimed features of this release is the Indie version, which is a version of Houdini for freelancers and small studios. This now has support for third party renderers like Arnold, RenderMan, OctaneRender, plus the included renderer Mantra. V-Ray, Redshift and Maxwell are also working on plug-ins for Houdini – this is huge since more people will eventually be able to use Houdini with tools they already know. Houdini 15.5 features new improvements in the viewport; you can view displacements directly, so you will no longer be waiting for renders to judge or tweak your displacements. The new viewport is so good that it compares to results from Unreal Engine 4, this means that game artists can have a better idea of their assets while working in Houdini. It's also the fastest viewport Houdini's ever had, which makes animation fluid and unconstrained. Since the playback is really fast, it's really easy to review your work, making it a joy to work with over a space of many hours. Houdini 15.5 also brings a ton of new features to its already amazing Crowd tools, now with accurate foot planting and terrain adaptation. The new Mocap Biped comes with an integrated animation library for fast turnaround and testing. You can also easily import .fbx animation from any package and the crowd solver is much faster. All this makes for a better, more fluid workflow while creating crowd simulations. Delta Mush – a deformer originally developed by Rhythm & Hues Studio – is also now part of Houdini 15.5; this means that your characters can deform more smoothly, with less effort and tweaks than before. Other improvements include: VR Lens Camera (so you can render VR images), Tri-planar UV projection, curvature support for UV Bake, and UV packing help with UV tasks. There's also 3D Handle and geometry snapping enhancements, hair and fur grooming enhancements, faster VEX functions and faster saving of large geometry. Overall, this version brings a huge shift in the way Houdini is perceived and used – it can now be part of the whole process from modelling, animation, VFX to rendering. Whether you're creating a small game, an indie film or a huge blockbuster, Houdini 15.5's proven set of tools make it an amazing creation tool for all kinds of artists. This article originally appeared in 3D World issue 213; buy it here!